Today Apple finally released the official version of iTunes which includes the revolutionary new Match system. 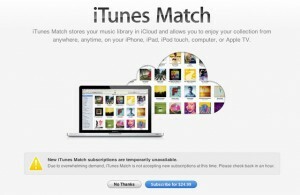 iTunes Match is a new cloud based system which allows users to access their music through the iCloud on any of their Apple devices for a low monthly cost. The iTunes Match update is free for iTunes but in order to take advantage of the cloud based system it will cost you $25 a year. Considering that this gives you access to music from anywhere it may very well be worthwhile to take advantage of this system. Unfortunately this system only works for songs that are actually available on the iTunes market so you won’t be able to access anything that is not iTunes available. Overall though iTunes Match is expected to be a big hit with iTunes and music lovers because of the quick and easy access it provides to everything.